KNOWING GOD Over the past twenty years J. 1. Packer's classic has revealed to over a million Christians around the world the wonder, the glory and the joy of knowing God. 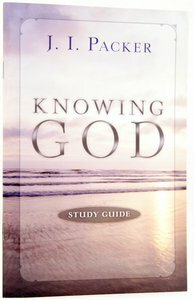 This study guide helps groups of Christians to understand and apply the essential truths of Knowing God. It contains twenty-two studies, one for each chapter of Knowing God, allowing groups to break it conveniently into two eleven-week sections. - Publisher Over half a million people have found J.I.Packer's classic,Knowing God,to be an immense help. And tens of thousands have used this study guide to know God even better.This guide takes readers through the essential truths of Packer's book. Individuals can stretch their understanding and allow the material to change their lives. Small groups can see God more clearly through rich and transforming discussions.In this guide are twenty-two studies, one for each chapter of the book. A Sunday-school class, neighborhood study or campus group will find it breaks conveniently into two eleven-week units.Start your adventure today! About "Knowing God (Study Guide)"
Over half a million people have found J.I.Packer's classic,Knowing God,to be an immense help. And tens of thousands have used this study guide to know God even better.This guide takes readers through the essential truths of Packer's book. Individuals can stretch their understanding and allow the material to change their lives. Small groups can see God more clearly through rich and transforming discussions.In this guide are twenty-two studies, one for each chapter of the book. A Sunday-school class, neighborhood study or campus group will find it breaks conveniently into two eleven-week units.Start your adventure today!